This week I took a short break from video game coding to crank out some web tools for a table top RPG that I play with some local friends. 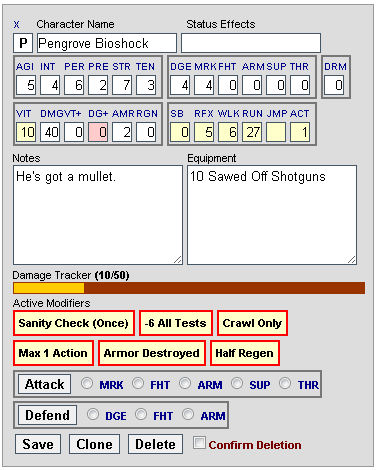 The screenshot above is part of a combat manager application that I wrote in php. It's main purpose is to manage all of the NPCs in a fight so that the game master doesn't have to keep flipping through a binder full of different pages of enemies to keep track of what's going on during the battle. It should make our games go along a lot quicker, although some people really like to have physical dice make all the decisions. When you have a battle involving 15+ characters though, dice rolling can get tedious pretty rapidly. Now back to game development!